The greatest gift my parents gave to me next to life itself was a sincere appreciation of nature and the outdoors. Throughout my lifetime nature has helped me to feel grounded and connected. In recent years I’ve become concerned that many children, and now even their parents, are living lives of virtual reality through computer screens rather than experiencing the real world directly. Computers are great tools. They shouldn’t become all-encompassing ways of life. After reading Richard Louv’s book “Last Child in the Woods: Saving our Children from Nature Deficit Disorder” my concern was validated that our society had a serious problem! I bought several cases of the book and gave them out in my community of Lawrence, Kansas. Through this effort we soon had a group of over 100 Advocates supporting the initiative of Nature Education for Kids. Through our regular meetings our group determined we needed a cool logo and thanks to Greg Thomas of the KU Design Department our logo: “Outside for a Better Inside” was created. We also thought a short, catchy song would carry our message into the future. Thanks to Kelley Hunt our “Let’s Go Outside” song was written and then recorded with Kelley singing accompanied by Janeal Krehbiel and the Lawrence Children’s Choir. Our most noteworthy accomplishment to date is completion of the “Outside for a Better Inside Trail” located in the Sandra J. Shaw Community Healthy Park. 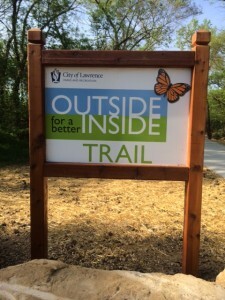 This park and trail was a true community collaboration in which Outside for a Better Inside helped start the conversation and pursued the objective over a five year period. We are currently working to merge our “Let’s Go Outside” song with dynamic, professional video of kids in nature. We intend this two-minute video to be so engaging that it will carry our message to many future generations! Thanks to Kelly Hunt for our new song!